And Open Your Doors To New Customers! Google Business Photos and Tours in the Northwest by Local Exposure North West. Google Business Photos is an exciting new feature created by Google which helps local businesses market themselves using existing street view technology. Once a customer finds your tour online they can take a fully interactive virtual tour around your business premises, allowing you to showcase your business to them. This allows potential customers to explore and experience your premise online before deciding whether to make a purchase online or encouraging them to visit you in the ‘real world’. Google have created an official video of the Google Business Photos scheme, illustrating how it can effectively engage online customers. Check out this video, it runs for less than a minute. The popularity of Google Business Photos and Tours is rapidly increasing as it spreads across the United Kingdom. Similar schemes are being developed in major cities across the world. 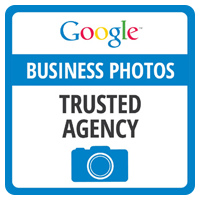 Local Exposure were selected to become the first trusted Google Photography Agency and is now the No 1 Google Business Photos Trusted Agency in the UK. In the North West the main areas we cover are Greater Manchester, Lancashire, Cheshire, Merseyside and Wirral, Staffordshire and Cumbria. We also cover the Midlands from our Nottingham offices. We have several experienced staff photographers to produce the Google Business Tours and we guarantee to deliver only the very highest standard of tour and the quickest processing times. Great Idea! How Does It Work For My Business? Google Business Photos will help your business stand out by enhancing it within Google’s search results, Google Places, Google Maps and Google + Local. Google has also created a simple html code embed, allowing you to upload it onto your website or any social media platforms you may have. Your Google business Photo shoot will also include several ‘points of interest’ still photos, which are a series of professional photographs illustrating some of the unique selling points your business has to offer. These ‘points of interest’ photographs will also enhance your search result listing as they will appear in Google’s search results and be shown on your Google + Local Page. The other great thing about Google Business Photos is that you do not even need a website to display your tour or worry about the tour using all the data limit on your website server if you do happen to have a company website. Once the tour is uploaded Google will host it on their servers, displaying it on your Google + page. If you do have a website you will be able to embed the tour using a simple html script. An interactive virtual tour of your business, which can be accessed from Google+ Local, Google Search and Google Maps. This tour can be embedded into any website or social media platform. A great selection of ‘point of interest’ photographs will be professional shot by one of our staff photographers. These photographs will also be added to your Google+ Local Page, they can also be used for any offline marketing purposes. The creation of a Google + Local business page, if your business does not have one already, which the Google Business Photos and Tour will be uploaded onto. Once the tour has been uploaded onto your Google + Local Page one of our Business Development Managers will demo the features of the tour free of charge. How are Google Business Photos done? The Google Virtual Tours consist of a series of 360 degree panoramic images, which when stitched together provide an immersive user experience. The panoramic images are created by taking a series of photographs from a single spot, the camera is rotated on a special rig creating a 360 degree field of view. We will normally start taking panoramic images outside your business premises, with 2 images linking to Google Street view, if possible. We will then take a series of panoramic images every 5 – 15 feet throughout your business, these images will then be stitched and linked together allowing a virtual walk through of your business. One of Local Exposure’s experienced staff photographers will then take several ‘point of interest’ photographs. You are free to advise the photographer as to what photographs you want taking, we will try to make your business look as good as possible. Once all the photographs have been taken they will be returned to our editing suite where they will be checked and uploaded to Google’s secure work area. The images will then be stitched together and linked to create a virtual tour of your premise. Special Geo location software will then be used to position all the panoramic images on Google Maps, the tour will also be integrated into Google Street view. Once this is complete all the photographs will go through Google strict quality control processes, after this is passed the tour and points of interest photos will go live. Local Exposure is a Google Photography Trusted Agency which employs several staff photographers and image editors, this allows us to provide fast processing times. Many of the businesses we deal with already have preferred photographers; sadly Google will only accept photographs taken by photographers they have certified. Certified photographers and agencies need to undertake special training and testing by Google. Once the photographer / agency have completed the training and examination they are awarded the qualification Google Trusted Photographer and are free to create Google Business Photos and Tours in their local area. Local Exposure is a fully qualified Trusted Google Photography Agency, employing several fully qualified staff photographers. This allows us to have very fast shot and processing time and to be competitive on price. The cost of getting Google Business Photos done for your business can vary depending upon the size of your business and requirements you may have. We are a Google Agency, employing several full-time photographers, which allows us to be very competitive on price. Getting a tour done maybe more affordable then you think, for an accurate quote call us today on 01942 517 323 or fill in your details in the contact us box on the right of the page and we’ll call you back.